They all count, but I want to highlight one really strange situation. FAVORITE SONG (FS) – something highly suspicious going on with this one! This gelding was purchased at the 2014 Keeneland yearling sale, by an Agent Ben Glass (so the actual owner who purchased the horse is not disclosed) for $275,000. In his first race the owner is listed as Paul Braverman, but only Ben Glass could confirm if this was the original owner that purchased the horse or if it was subsequently sold. In his next 2 races his owner is listed as TOLO Thoroughbreds Inc, obviously a different owner, but you still can’t tell who exactly the owner is because this is a corporation. FS first published workout is in 2018 so this horse, that they paid exorbitant amount for, only had it’s first workout as a 5 year old! You know something is seriously wrong with a horse when they pay this much and don’t work it until it’s 5!! Here’s where it gets even more stranger. FS had his first start at Churchill Downs 6/25/2017 with no previous published official works because the first published official work is in 2018. 810 KAR 1:027 ENTRIES, SUBSCRIPTIONS AND DECLARATIONS. A horse starting for the first time shall not be permitted to start unless it has three (3) published work outs, one of which is from the starting gate, and one which is within twenty (20) days of entry. So what the hell is going on here – WTF? The Racing Secretary at any track has a fiduciary responsibility to ensure that all horses meet the rules before they start in their first race so how in the hell was this horse permitted to run? How was FS, a first time starter, permitted to enter with NO official works published according to Equibase? So on 6/25/2017, at 4 years old, his first start is at CD with no prior official workouts contrary to rules? Where in the hell were the state vets who scour over these entries every day, and how would they permit a horse to run with no official works indicating that the horse wasn’t ready or sound? Then shows up and races at Fairgrounds on 12/6/2018 about 1 year and 6 months after his last race. WTF – you know something is seriously wrong with this horse for this to be going on, and these people need to be investigated especially Ben Glass who purchased the horse under secrecy. Then his last race, pulled up in distress, is horrific given this racehorse’s past, his price, and the total lack of transparency. This situation warrants a neutral investigation by the FBI because the horse racing integrity group is a joke. Wonder if Favorite Song is dead or alive, and I wonder if he was insured if he died? This is unbelievable – you can’t make this stuff up. His workouts were not completely shown on the workout tab. I had to look into further and there they all were. This horse did have 3 official workouts before his first start. However, the rest of the story is still not right including the gaps in racing which indicates something is seriously wrong. I apologize to this blog for this misstated information. This situation is still very strange, and this horse needs to be looked into. In the least, his medical records. Nevertheless, he’s a victim of this vile business. That`s okay Gina we all make mistakes and if anyone sees any made by us we don`t mind their being pointed out to us.Right now our local track is listed at a temp of 26f and most likely is FROZEN but their card is still scheduled to begin a t 12:30 pm. On that HARD track which we know from personal experience, we wonder how many breakdowns will happen today since the horses are undoubtedly tired as it is near the end of the meet. 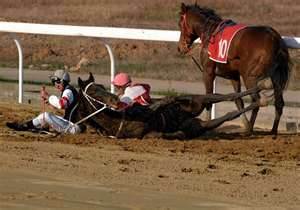 We fear and feel for all those horses training and racing on that at times hard as I5 freeway track surface. Oh god…..the 2nd Saturday in May is coming up. All the ladies in their dinner sipping mint juleps. I will never watch another race as long as I live. I stopped when Barbaro injured himself in the Preakness. What the hell is wrong with people? I applaud Horse Racing Wrongs for getting the word out. I have shared many posts in hopes of enlightening people. This is a horrible business. I pray it goes the same as Greyhound racing.